Perfect place to stay with your family! Captain's Bay Condominiums are located across the street from one of the widest, most fantastic beaches in Florida! Take the trolley to Times Square or to the Fort Myers Beach Pier at the north end of the island. Excellent restaurants, fun shops, golf, jet-ski rentals, and parasailing... All available on the island. Day trips to Key West via boat available, as well as dinner cruises, and deep sea fishing charters. Condo features 2 King size beds, 2 singles, and 1 pull-out sleeper sofa, and pack-n-play that can sleep up to 8 people. Includes a beach cart with two umbrella's, four chairs and a cooler. Wifi, HBO, and Netflix are included. You can see the Gulf between the buildings across the street. You can see the beach and Gulf coast across the street, over and between a couple beachfront buildings. Bac Bay is just behind the unit to the north. Comfortable seating for TV viewing or reading one of many books for your pleasure. Fully equipped kitchen with pots & pans, utensils, dinner ware. Everything you need to prepare a meal. 2 additional bar stools at counter and seating in the front lanai off the kitchen. Samsung Smart TV 55' HD in Living Room, each bedroom has an HD TV too. Look out over a natural preserve of Mangrove Trees. Front and Rear Screened Lanai's, with views of the island. 4 bicycles to be shared between two condos. Availability is first to come, first served. Jet Skis available for rental on the beach! Clean and comfy with everything you will need! We were very pleased with our stay in this condo. Very clean with Comfortable beds!!! Just a walk away from lots of delicious places to eat and across the street from the most beautiful beach. This condo met all of our needs and the beach cart was an awesome bonus!!! 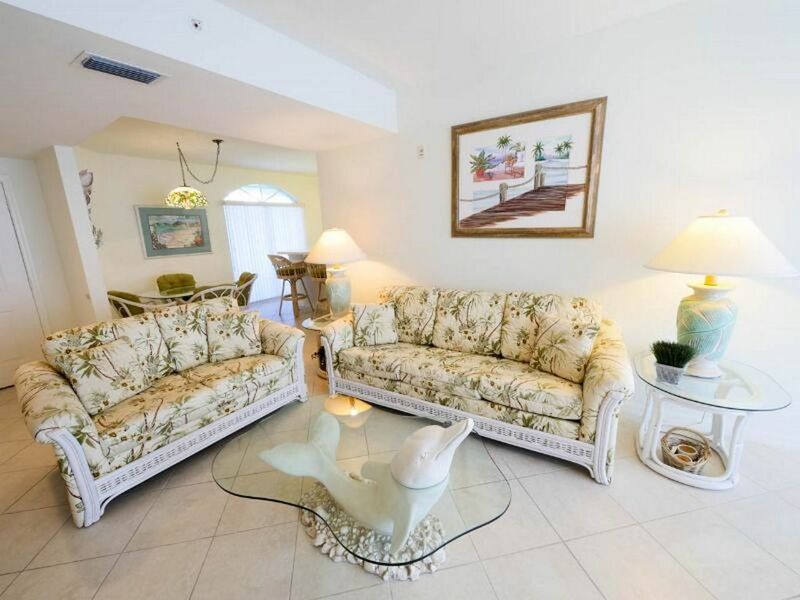 Condo was clean and well kept with easy access to the beach and only a short drive from the downtown area. Would definitely recommend! We had a great stay in this condo. It is big, has everything you need and just a short walk to the beach. Great space for our. Girlfriend reunion. Two porches for gathering. Well supplied. Loved pool area. Enjoyed south end of island beauty. We really enjoyed our stay at Captain's Bay. Close to beach plus pool and tennis. Rates are subject to change until reservation is made. Property is listed on many sites, many people miss bookings by minutes by waiting and not booking.